A few Call of Duty writers on staff here at eSportsNation made predictions for the North American Call of Duty World League Stage 1 Playoffs and Relegation. Come see what they think. 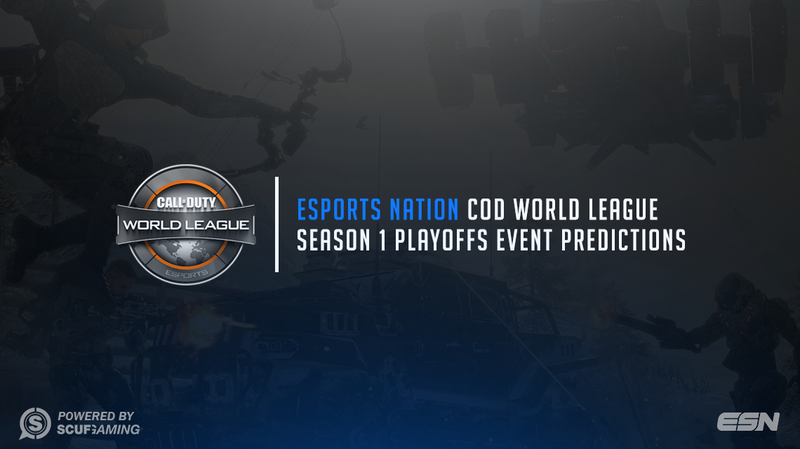 A few Call of Duty writers on staff here at eSportsNation made predictions for the North American Call of Duty World League Stage 1 Playoffs and Relegation. Without further ado, let’s take a look at what everyone thinks. Team Kaliber struggled greatly during the regular season, evident by their appearance here in the relegation tournament. Still, they are the highest seeded team here and have unquestionable chemistry as this roster has been together for quite some time. King Papey have a fan-favorite in Matthew “ Royalty ” Faithfull, known by many as “that guy who’s really good and plays on really high sensitivity” during his time on the North American Epsilon eSports team last year. Otherwise, it’s worth noting that this squad is the lowest seeded team in this tournament and will have to fight hard to make it into the league. Coming off of dropping Nick “ Happy ” Suda in favor of “the best SnD player in the world” in Adam “ KiLLa ” Sloss, Dream Team have looked undeniably better in league play. Ending the season on a three game winning streak, Dream Team look to carry that momentum over into relegation and take out Cloud9 Eclipse. Cloud9 Eclipse as a squad look pretty solid, and have spent some time together this year after previously playing under Enigma6 Group . A squad laced with veterans and possible brilliance, they’re itching to get into the league and will do anything to make it. This H2k squad has shown flashes of absolute brilliance, but they just can’t seem to get it together as of late. They seem to fare better on LAN, which showed when they upset OpTic Gaming at UMG South Carolina, but it’s all a question of if it will be enough. The roster for Team Liquid has proven itself time and again so far. Showing that they are almost undeniably the top amateur team in all of Call of Duty, the guys on Liquid are ready to prove that they deserve to be taken more seriously. To be completely honest, this CLG squad has not looked very good at any point this season. They aren’t exactly bad, but it would hardly be considered an upset if the “amateurs” of Cloud9 won this match. This roster hasn’t shown much, but they could certainly show up and win if they play to their full potential. Cloud9 has a squad that is just plain fun to watch. They really just seem like they’re enjoying what they’re doing, which is something a lot of teams seem to miss. More than that though, their talent level is impressive. These guys are professionals, and they won’t back down from a challenge. Despite being seeded #2, Rise Nation seem to be the best squad on LAN this year. Luminosity, however, did place second at the last LAN event, so this fight could be closer than people think. There’s not much to say here. Team SoloMid barely survived keeping out of relegation, and this OpTic squad is dominant. No one likes to predict an easy match, but this one looks all too simple. The best match of the first round by far. Both of these squads have had their ups and downs, but Team EnVyUs is the one to focus on. Patrick “ ACHES ” Price is an unforgettable man, and his attitude will likely be what makes this team win or lose. We haven’t seen FaZe this confident since their toppling of OpTic Gaming and their run of victories last year. It’s a tough order for compLexity, but this match won’t be an easy one for FaZe. Expect a tight one. In a match of titans, it’s hard to pick a victor. This team for Rise has proven their strength, but the players on FaZe are hot and looking to reclaim the glory they once knew. This game will come down to the wire, and it could easily be the best one of the tournament. We may not be unanimous on Team eLevate vs Team EnVyUs, but everyone can agree that OpTic will win this match. It won’t be easy, but the guys on OpTic want to bring in their first championship of Call of Duty®: Black Ops III , and anyone in their way better be playing all out if they want to stand a chance. Sure to be a fantastic match, any of these three teams has the capability to claim the crown this weekend. FaZe look to prove that they can beat OpTic on LAN, Rise look to prove that their success in this game is no joke, and OpTic look to prove that they’re still the best in the business. No matter what happens, this match should not disappoint. Who do you think will take home the championship? Agree or disagree with our predictions? Either way, let us know in the comments below or on Twitter @eSportsNation and be sure to follow us for live coverage of the event this weekend to stay up to date on all of your eSports needs.